The Fall Issue of the Journal of Personal Finance is now available from the International Association of Registered Financial Consultants (IARFC). This practitioner oriented distinctive publication promotes research to examine the impact of financial issues on households as well as research on the practice and profession of financial planning. We are excited to introduce a variety of research articles and case studies, along with the possibility to obtain CE credit from the journal for the first time...Dr. Wade Pfau, Co-Editor. Initiated in 2002, the Journal of Personal Finance has grown in scope, acceptance and recognition among practitioners and academicians. The Journal welcomes articles from practicing financial professionals and consultants about financial products and services, client relationships, retirement planning, long-term care, practice management, and firm operational efficiencies. Wade D. Pfau, Ph.D., CFA, RFC® - Co-Editor is a Professor of Retirement Income in the new Ph.D. program for Financial and Retirement Planning at the American College in Bryn Mawr, PA.
Walt Woerheide, Ph.D., ChFC®, CFPTM, RFC® - Co-Editor has been at the American College for 14 years and served as VP of Academics and Dean for 12 of those years. He is a member of the Master Registered Financial Consultant (MRFC) Certification Board that oversees the Association’s path to third party accreditation through the NCCA. Do Self-Control Measures Affect Saving Behavior? Is Deferring Social Security the Lowest Cost Option for Adding Guaranteed Income? 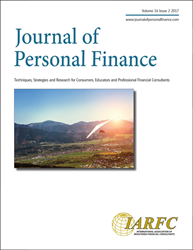 To order a hard copy or electronic version of the Journal, to find out more information or to review article submission guidelines, go to http://www.journalofpersonalfinance.com or contact the editors. To take the CE quiz email editor(at)iarfc(dot)org.